Enjoy an intuitive, pleasurable shower in comfort and style with the Euphoria SmartControl 260 MONO Shower System. A fully thermostatic shower system that has it all, the innovative SmartControl technology allows you to select and combine head and hand shower as well as spray patterns and to adjust the water volume at the push/turn of a button. Both head and hand shower offer a choice of luxurious spray patterns. GROHE DreamSpray ensures that the flow from each and every nozzle will be even, no matter which spray you choose. For perfect comfort and safety, the integrated GROHE TurboStat technology prevents unpleasant temperature fluctuations while the SafeStop button protects your sensitive skin from scalding, and thanks to the GROHE CoolTouch system, the shower valve body will never be too hot to touch. 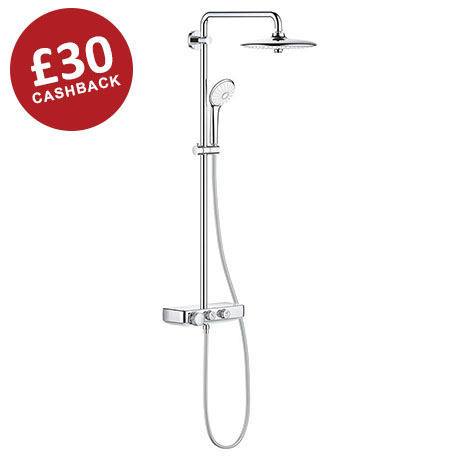 TO CLAIM: Purchase your qualifying GROHE SmartControl shower and simply complete the cashback claim form HERE and claim £30 back today. Offer on purchases made from 1st January 2019 until the 31st May 2019. All claims must be made by the 30th June 2019.